"Gather yee, gather yee for tales of generations past. The time has come to wrap things up nicely thus on week eight of SOAGC is somewhat expected Top 10. My top ten that is, so don't go nuts if you find something terribly weird in there and of course it's impossible to get every awesome good game up here… not that particular fact would stop me. Let's do this!" Yes, I should have "The Windwaker" up here, a game I adore from the first day I saw it moving. But I would be doing a disservice to everyone not to remember the last great GameCube sendoff, the amazing "Twilight Princess", a game so often delayed it would end up as a lunch title for the Wii. But motion controls aside, this is indeed very much so a GameCube game, one that delivered all the promises of an adult Link adventure as it was seen many years before at the GameCube e3 demo reel. 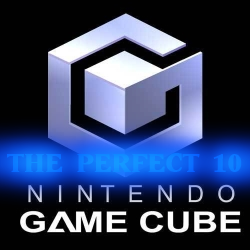 It's an amazing feat for the humble Cube itself, a tremendous adventure with quite some darker elements than we were used to in the Zelda series. It is games like these that keep me coming back to Nintendo over and over. Can you blame me? … Black & White Superhuman Dodging Skills! Oh Treasure, can you do no wrong? Jumping from Dreamcast to the GC, "Ikaruga" remains up to this day one of the finest examples of shmup ever programmed. The entire game revolves around mastering the polarity-change concept. The player's ship can switch between black and white. When black, it's immune to black fire and deals extra damage to white targets, vice versa when it's white. Sounds simple enough until Treasure starts filling your screen with bullet hell nirvana. I would never believe I would ever write this: I had to train my brain to play this game. I had to learn by playing and replaying every level until I knew exactly what would come up and what polarity I had to have my ship every time. Exhausting yes but oh so rewarding when it works… hmm, I think I will be replaying this later on. … Sending Him Home With a Ton of Love! I'm a huge fan of Fire Emblem ever since I first discovered the game series on their 16 bit Super Famicom début (yep, I was oblvivious to the Famicom ones). I was really glad the game became a huge hit when it was first officially released in the west in its Game Boy Advance iterations. I cleared the way for the very first Fire Emblem that would break away from beautiful sprite art to 3D polygon models. I am always afraid when game do this transition, but Nintendo has proven time and time again they know what they are doing. "Path of Radiance" stole many hours from my life, and to a perfectionist like me, having people die or missing secret characters was not an option. Fortunately due to the amazing plot and soundtrack this never became a shore. The Greil Mercenaries remain strong in my memories and it was an amazing bonus when it was revealed the story would continue onto Wii's"Radiant Dawn". Truly one of the highest peaks in this always stellar series. Nintendo should begin selling GameCube games on Virtual Console because I am sure that many newcomers to the series with "Awakening" did not get the chance to experience this one. Ok, it is really unfair to call it that because "Soulcalibur II" is so much more than that. I would go as far as to call it the perfect sequel. Like "Street Fighter II" it took the previous game and turned to knob all the way to eleven! In fact it turned the knob so high that the series has been having a tough time keeping up with this third entry's level of brilliance. It remains one of the finest one-on-one slash'em'ups and even with its recent HD digital re-release can't hide the fact that we really loved to play Link because he fit so well with the other characters, making the GameCube my favourite version of the entire lot. If you have a Wii capable of GameCube compatibility and see this one cheap, don't pass it on! … The Force Being Very Strong On This One! I recently saw the last thirteen episodes of "Star Wars: The Clone Wars" and it reminded me just how awesome this universe can be. Like some of the games I am covering today, I have previously mentioned "Rogue Leader" as being my favourite Star Wars game to this day. It alone sold me on the GameCube. All those iconic battles of the original trilogy where right here, playable with graphics capable of rivalling the original model kits. From a guy that had been playing Star Wars games since the 8-bit ZX Spectrum, this thing blew my mind and it still does every time I boot it up. A shame that now both defunct Factor 5 and LucasArts could never really bring anything in the series back to this high level of polish. Let's hope current license holders EA know what they're doing with the current hardware. The fans deserve it. … Snakes & Giant Robot Dinosaurs! It pains me to see how Silicon Knights have fallen from grace. It was hard for me to choose between this and their amazing original work "Eternal Darkness: Sanity's Requiem" but in the end, "The Twin Snakes" won out. It was one heck of a surprise when Nintendo and Konami revealed that along with Silicon Knights they were bringing exclusively to the GameCube Hideo Kojima's Playstation masterpiece "Metal Gear Solid" using a modified version of the "Metal Gear Solid 2: Guns of the Patriots" game engine. No matter how many times Kojima says he is done with the series, no matter how many plot twists and turns the new entries will throw onto play, the fact remains that this is my favourite Metal Gear of all time. I sense it will remain so for as long as I live too because it came as fruition of technology, brilliant voice acting, fantastic plot and very high production values. Somehow even with today's nearly infinite possibilities granted by technology these are not so easy to replicate. Even today Psycho Mantis continues to amuse me with his "controller moving by the power of my mind" trick. I had covered this one previously here, so I don't have much else to add today. "Resident Evil 4" is what happens when you leave Shinji Mikami run wild and drop previously established convections that stood as base pillars for the whole "Resident Evil" series. As GameCube owner I ended up winning a game that was one whole generation ahead of its time but as gamers of all kinds, we won a masterpiece of third-person survival horror/ shooting hybrid that many still use as template for today's games. Good thing this keeps getting released with new, shinier graphics so more people can discover it's wonders. … Super Metroid Samus In First Person! The title says it all! But it took me a very long time to accept this because "Super Metroid" is one of my all-time favourite games ever. When Retro's "Metroid Prime" finally came out, professional reviewers praised it to no end, but I remained happy and blissfully entertained with my GBA version of "Metroid Fusion". A good friend of mine who bought the GameCube before me got this game and made me play it. It was good, but it was so weird to let go of the 2D Samus I was used to. When I did finally bought the GameCube in the beginning of 2004, this was my fourth game, after "Pikmin". I sat down and said to myself "This is happening. There is no stopping technology and the leap to 3D. I must let go of the old ways and embrace the future. I must discover why people are so in love with this game that they even forget Halo and Killzone exist." Probably one of the wisest decisions I made in my three decade old gaming career because Retro had done it: they successfully recreated the loneliness exploration of an alien world from "Super Metroid" into the third dimension. Make sure you get Wii's "Metroid Prime Trilogy", you're doing yourself a big disservice if you pass on this experience. Don't even get me started on the music! … You Got Boost Power! Well, this number one surprised just about none of you. What still surprises yours truly is how Nintendo seems to be unable or unwilling to produce something even greater with today's technology. It's been a long and F-Zeroless decade, but I must maintain my belief that one day "F-Zero GX" will be bested. Surely it can be done, right? Maybe with SEGA along for the ride again… how strange that out of 145 GameCube games I currently own, the very first I bought it's still my favourite. But anyone who has played it surely understands my choice, right? It's hard not to be impressed by this one, even by today's standards. Remember: GO FAST! Aw man, is it over? I still had so many more games to write about, but that the problem with "Top Tens": they only allow ten entries. So special mentions to runners up in no particular order: "Spartan Total Warrior", "Tales of Symphonia", "Time Splitters 2", "Mario Kart Double Dash", "Super Smash Brothers Melee", "Pikmin 2", "Custom Robo" and "Viewtiful Joe". Thanks a lot for everyone that has been reading and providing feedback on my "Stuck on a Game(Cube)" arTAYcles for the past eight weeks. I had a lot of fun replaying my old games, it allowed me to gain perspective of where we come from, where we are today as an industry and where we are heading. Yet life never stops, life only moves forward, one second at a time and there is nothing we can do about that since we are all living in borrowed time. But taking a step back to put things into perspective? Very healthy indeed. Until next we meet: Play Hard, Play LOUD! PS: I will have a relatively quiet output over TAY for the next upcoming weeks due to some shiryus work related issues. I expect things to get back to normal early April.